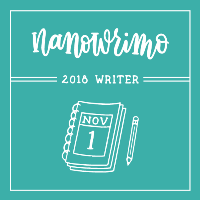 Continuing on in my Surname Notebooks and all their quirks… I am giving you a grand tour of my OneNote Surname Notebook section by section and page by page. (Hopefully it still won’t turn into a 3-hour tour and we end up on stranded on Gilligan’s Island…) The very last Section in the Main Section Group [explained in this post] is for Page Templates—templates of the pages I use for each family group in my surname notebooks. 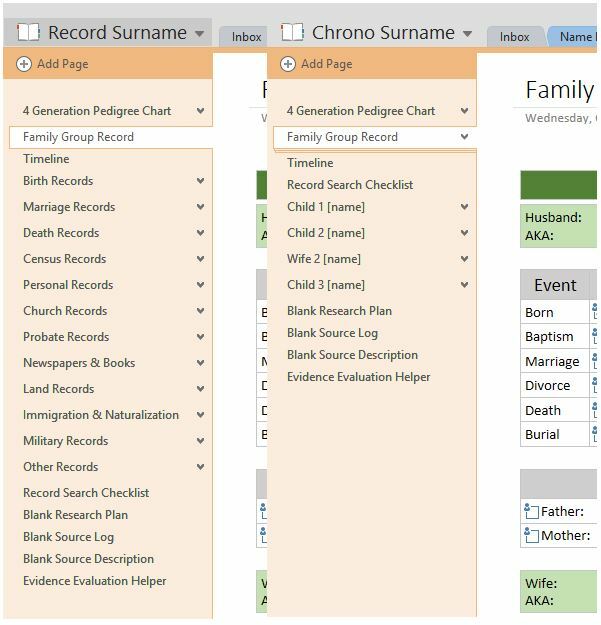 When I started out at the beginning of 2014 putting my research files into OneNote, I had the Pages for each family group organized by record type—BMD, Probate, Land, etc. My original thoughts were that this would help guide me through the research process as I looked for sources in each record type. I have since switched to keeping the Pages for each family group sorted by person and the sources for each family group and person are listed in chronological order. The reason I switched mid-stream is because that is the way the record images are sorted on my hard drive—by person and in chronological order. Sorting everything in OneNote the same way I do on my hard drive allows me to see that I have an entry on the Timeline for each entry on the Source Log and every entry on the Source Log has a Source Description Page that includes its Source Citation and all that matches the list of files on the hard drive. I decided to keep the Record Type Surname Notebook as well as the Chronological Surname Notebook because I know that some people sort their record images by type on their hard drive. I thought it would be beneficial to have a Surname Notebook that sorts by record type for those that do. All the information gathered and sorted in both notebooks is exactly the same, it is just presented in 2 different formats as shown in first graphic above. 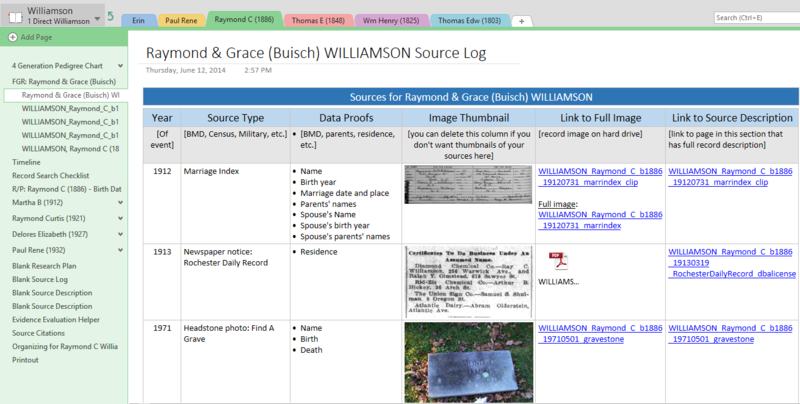 Both notebooks have Family Group Sheets, Timelines, Record Checklists, Source Logs, Source Description Pages, and Research Plans with a Research Log. Above the FGR is a place to put charts to help you navigate where you are in your family line when you are working on a particular family group. 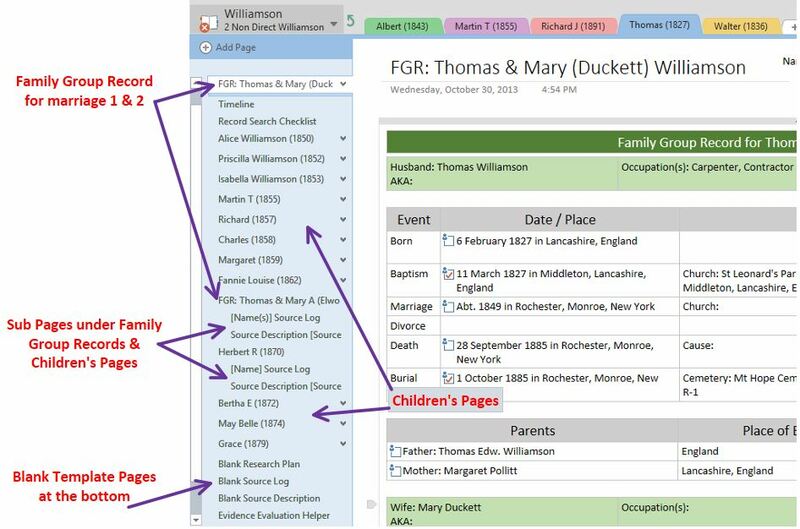 The charts can be printed from your genealogy software right to OneNote or clipped from a screen shot in your software, from Ancestry or FamilySearch. The charts do not have to be a 4 generation pedigree chart. 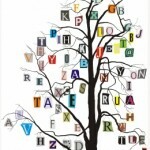 Use whatever will help you keep track of where this family group fits in your tree. Below the FGR is a page for a Timeline. 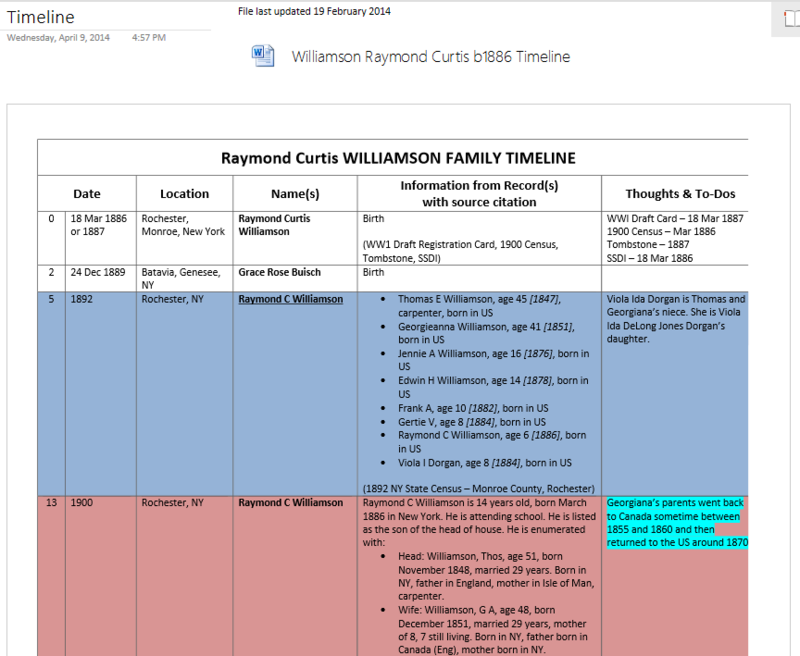 I like using Timelines to help me sort through the information I have gathered to see what is missing and where there are conflicts of information. Use or disregard this template as you desire. Below the Timeline is a Record Checklist that you can use to help guide you through the research process. As you locate a source, check it off on the list. In the Record Type Surname Notebook, this list is broken down by record type instead of being one long list and appears in sections on the Page for each record type. After the Record Checklist is where I am keeping my Research Plans. The form I am using for Research Plans has a Research Log at the bottom of the page. Instead of keeping one Research Log for all my research or sorting it by surname, I am keeping a log of the research and searches I do in conjunction with planned research on a person or family group. [My reason for doing it this way can be found here [LINK]]. 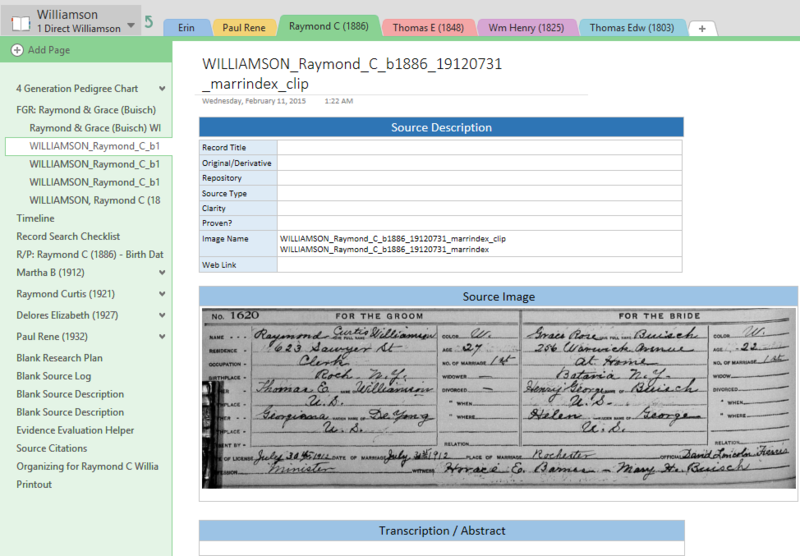 If you prefer to keep a log by surname, you can start a Section in the Main Group for your Research Log and keep it there. If your Research Log is in Excel, embed it on a Page in that Section and with a click you can open your Excel Research Log. Any updates to the log will be reflected in the embedded log in OneNote as well. Below the Research Plan are new pages for each one of the children. If the husband marries again, I add in a new Family Group Record for that marriage. If the wife remarries, her new FGR gets sorted under her new surname in the Non Direct A-Z Section Group. At the very end are some blank templates for the Sub-Pages that go under the Family Group Record and the Children’s Pages. The Sub-Pages are all about the sources themselves. The first Sub-Page under the FGR is a Source Log. It contains a list of every record I have for the family group or couple depending on how many sources I have. If there are a lot of sources for the children, I plan to give them their own Source Log as a Sub-Page under their name rather than on the Source Log under the FGR. On the Source Log is a thumbnail of the source image, a link to the full image on my hard drive and a link to the Source Description Page. 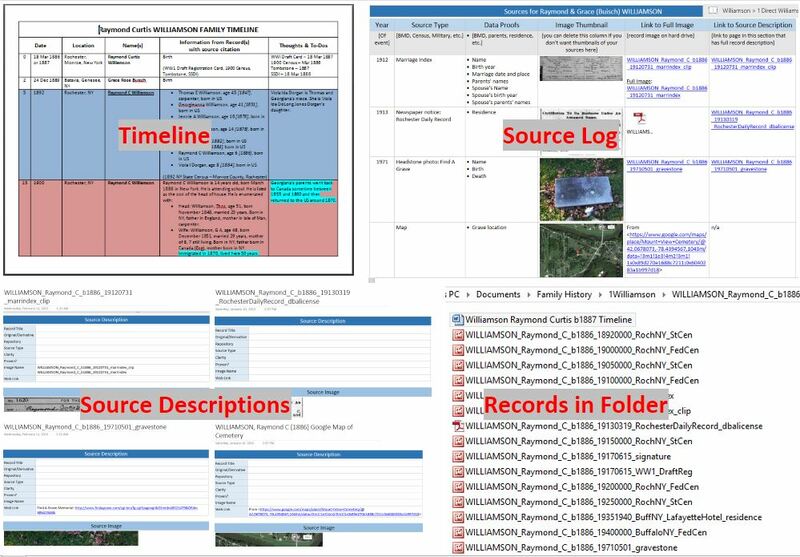 And finally, I owe a big, BIG thank you to Christine Sisko Svircev for sharing her Source Description page and Research Plan with us over at the OneNote for Genealogy Facebook Group. I wouldn’t have been able to put my page templates together without hers. And she helped me solidify my thoughts on the whole Research Log dilemma. Thank you, Christine!! Erin Williamson Klein, “Part 3 – Quirks Continued – Pages for Family Groups.” My Family History Files, 11 April 2014 (http://myfamilyhistoryfiles.com/organization/quirks-continued: [access date]). Great job and I will be back to check it out in more detail soon. You are welcome! I started out in OneNote 2007–way before I decided to use it for family history–so I have a bunch of notebooks! I have just finished reading your Quirks and feel like I’m drowning. Yes I’m on the Island. I have just started using OneNote 2013 to digitize my 12 note book binders and all of my certificates etc. I haven’t even put up pictures for each family. 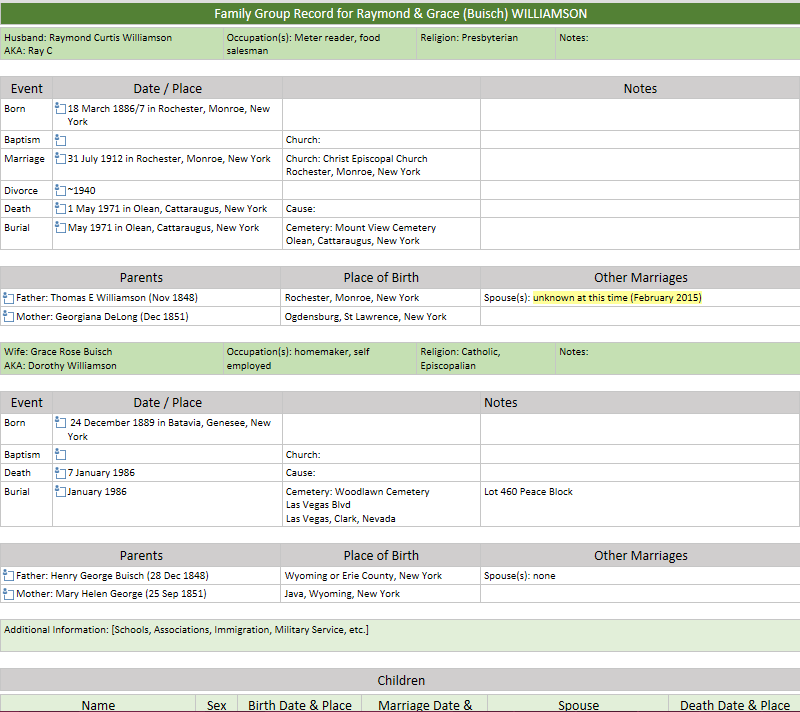 I was stuck on how to organize the Surnames and marriages etc. without making duplicate people. But If I take each piece of you information and work through it I might get there. 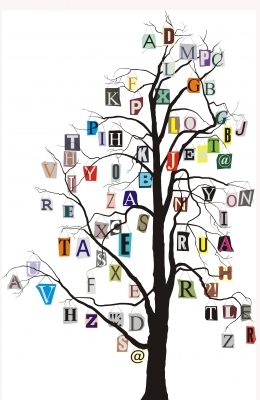 You have done an amazing job, putting up all this information for us genealogists. Thank You. I don’t quite understand the Surname Direct and Indirect yet or Collateral. So I think that’s where I’m having a little problem organizing all my information. So sorry, Katrina! I left you stranded on the island during a time I had no internet. If you have notebooks already sorted by family groups, you can just duplicate them in OneNote. I currently have 4 notebooks–one for each of my grandparents’ surnames. I haven’t gotten to the point of needing to separate them out into more notebooks yet in my do-over / digitizing efforts. Thanks for the reply. I will check out your blog tomorrow. Thank you so much for this great summation!!! I am still wading through trying to figure out what I can and can’t do with my iPad version of One Note, but your blog has been invaluable to me in the process. You put so much work into it…amazing!! !